Sub-streams support: A variety of streaming applications that customers build using Azure Stream Analytics such as IoT, connected car and automotive telematics, smart elevators, etc requires processing of telemetry streams from each asset or source by itself – all in the same job without merging the timeline from events belonging to different devices or sources. This is because their clocks may be drastically out of sync. The new sub-streams support in Stream Analytics will offer this powerful new capability with very simple language constructs. A new keyword OVER is being introduced to extend the TIMESTAMP BY clause for this purpose. More details can be found at the TIMESTAMP documentation page. Process data from different senders (toll stations) without applying time policies across different senders. The input data is partitioned based on TollId. Egress to Azure functions: Azure Functions is a serverless compute service in Azure that helps users run their custom code triggered by events occurring in Azure or third-party services. This ability of Azure Functions to respond to triggers makes it a natural output target for Azure Stream Analytics. Today, we are making egress to Azure functions from Stream Analytics generally available. This output adapter is designed to allow users to connect Stream Analytics to Azure Functions, and run a script or piece of code to trigger downstream workflows and accelerate response to key events. For example, it will now make it a lot easier for developers to send out email alerts or SMS notifications when certain pre-defined conditions such as overheating or hazards are observed on the factory floor. Egress to Azure functions will also allow developers to write the output of Stream Analytics to targets that are currently not supported out of the box such as Azure Redis Cache. Also, developers can author custom logic that will allow Azure Stream Analytics to connect to a variety of other Azure services or apps outside the Azure ecosystem. Additional details can be found at the Azure Stream Analytics documentation page. Query Compatibility: Compatibility level is used to represent any query behavior change introduced in Azure Stream Analytics. In extremely rare cases, a new compatibility level could introduce a breaking change for a job. Users of Stream Analytics now can set a choice of compatibility level for any job to ensure that they keep running without any failure. 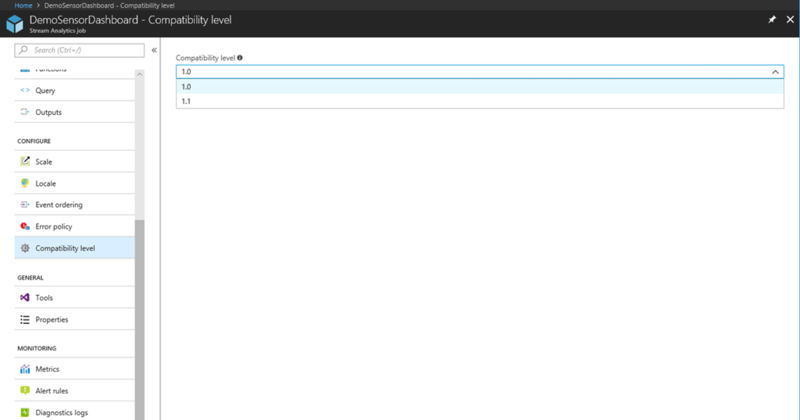 Compatibility level can be easily set using Azure portal (see below), or by using the create job REST API call. More details can be found at the Configure compatibility level documentation page. We hope that you find these features valuable. We would love to hear your feedback and request for new features via our user voice portal.